Earlier this year, WSRW's partner organisation in the UK, Western Sahara Campaign (WSCUK), issued proceedings arguing that the UK was unlawfully allowing products, originating from or processed in Western Sahara, to be imported into the UK under a trade agreement with Morocco. Law firm Leigh Day, acting for WSCUK, claims this is unlawful and that it is clear that Moroccan territorial jurisdiction does not extend to the territory of Western Sahara or to the territorial sea adjacent to Western Sahara. Therefore, goods and products produced in Western Sahara should not to be treated as originating from Morocco for the purposes of preferential tariffs or any other benefits conferred upon Moroccan products by European Union. The same is true in relation to fishing quotas allocated in the seas located off the coast of Western Sahara. Read the full text of the Judgement here. The Hon Mr Justice Blake drew attention to ‘allegations of serious human rights abuses by the Moroccan authorities against the indigenous members of the Saharan population’. He also noted, ‘reports of discrimination in the field of business and employment and political expression against indigenous Saharans in favour of Moroccan nationals who have moved into the territory since 1975'. John Gurr of WSCUK said: “this is a landmark step forward for the Saharawi people. For too long governments have ignored their obligations under international law and made agreements with Morocco to exploit resources that do not belong to Morocco and that Morocco only controls by military force”. Two EU Member States have a strong position on the subject of Western Sahara imports. The Dutch government has stated on more than one occasion that products from Western Sahara cannot enter the EU market labelled as from Morocco, a position shared with the Swedish government. Similarly, the EFTA countries do not interpret their Free Trade Agreement with Morocco to apply to Western Sahara. The United States explicitly excludes Western Sahara from its free trade cooperation with Morocco. At present, the European Court of Justice is reviewing the legality of both the EU-Morocco Fisheries Partnership Agreement and the EU-Morocco Free Trade Agreement covering agricultural products, precisely because they allow Western Sahara products to enter the EU market as if they were Moroccan. 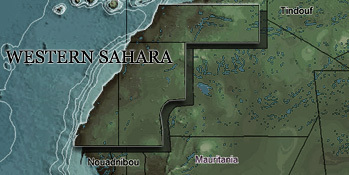 Western Sahara, in north-west Africa, is the subject of a decades-long dispute between Morocco and the Saharawi people. In October 1975 the International Court of Justice rejected Morocco’s territorial claims over Western Sahara and recognised the Saharawi people's right to self-determination. Since 1975 Morocco has supported the settlement of its citizens in Western Sahara, arguably in breach of Article 49 of the Geneva Conventions, which states: ‘The Occupying Power shall not deport or transfer parts of its own civilian population into the territory it occupies.’ The United Nations and NGOs such as Human Rights Watch, Amnesty International and the Norwegian Refugee Council have found evidence of human rights abuses.